Behind just about every dry cleaner’s counter are a number of preservation boxes with wedding gowns inside. But that does not mean that the wedding gown was cleaned at that shop. In fact, many local dry-cleaners do not clean and preserve wedding gowns in their own shop, but choose to send their customer’s bridal gowns out to wholesale dry-cleaners. Wholesale dry-cleaners provide a service for local cleaners who don’t want to worry about damaging those expensive wedding gowns, or taking all of the the space in their dry-cleaning machines. Some wholesale cleaners may pick up the dirty gowns from the local dry cleaner and drop off the clean and preserved wedding gowns after they are cared for. Other times the local dry cleaner might ship your wedding gown to a national wholesale cleaner. So, is this better or worse for your wedding gown? The main benefit for you, the bride (or mother, husband, etc. of the bride) is that you would assume the wholesale cleaners are experts at what they do. They handle hundreds of wedding gowns and should know what they are doing. Right? 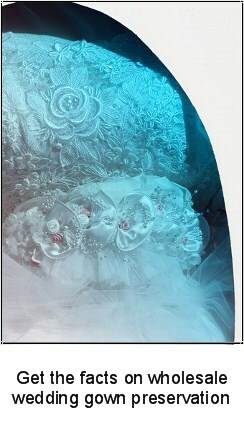 Wholesale wedding dresses are usually cleaned in very large machines, perhaps 30 wedding gowns at a time. Your wedding gown may actually be contaminated by another dress that is dirtier than your own. The preservation box is usually “sealed” so that it is impossible to inspect the gown and determine if it is cleaned to your satisfaction. The wholesale dry-cleaner cannot afford to be picky about stains, pressing, or his preservation materials. He has to keep his costs low so that the local dry cleaner can still make a profit on it. He also has the costs of returning the gown to the local dry cleaner by either shipping, or by delivery. Consequently you usually receive half the quality that you actually pay for. So now that you know about wholesale cleaners, you are in the drivers seat. When making a decision on who to care for your gown, be sure to ask any local cleaners if they do the work themselves or send it out to a wholesale cleaner. And ask about their preservation box. What is the quality? Is it acid-free and lignin free? Is the box sealed or can you open it and inspect the gown? 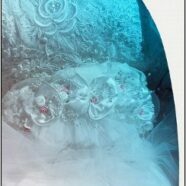 Be sure your wedding gown receives the proper care that will keep it in the best condition possible. We clean our wedding dresses one at a time – no contamination here. Learn more by reading our Wedding Gown Cleaning and Preservation Guide.